Go, Baby, Go! is this week's Featured Knickernappies Retailer! Go, Baby, Go! is this weeks Featured Retailer! Read our interview below and get to know Diane a little better! Tell us a little about yourself, your family, if you have little ones in cloth diapers, etc.-My name is Diane Turner, and I am the proud work-at-home-mom (WAHM) to 4 beautiful children. I have been married to my wonderful husband, Kelly, since 1998, and he has been with the San Antonio Fire Department since that time as well. I am a San Antonio native, and my family currently lives just outside the southeast corner of the city. We enjoy home-schooling our children, which we find is a perfect fit for the odd fire fighter schedule my husband is on, and it allows us to live at a slower pace and really enjoy our children. How'd you get started cloth diapering and what made you decide to open your own business? Go, Baby, Go! was born in October of 2007, when Kelly & I saw a need for natural parenting products close to home. I had worn each of my first 2 babies in different kinds of carriers, from the very mainstream and uncomfortable Snuggli, to the bulky, but better Nojo sling. I was introduced to the Moby Wrap by a friend when I was pregnant with #3. I wore my baby everywhere in the Moby Wrap, and everywhere I went, I was mobbed with people, usually other mothers, wanting to know what kind of carrier I was wearing and where I got it. I loved telling other mothers about the Moby Wrap and explaining the benefits of babywearing. I was also using cloth diapers with baby #3, which I didn’t do with my first 2. Once I found out more and more about all the options and how easy today’s cloth diapers are to use and how different they are from what most people think they are, I knew I had to share that information as well. Do you still have any little ones in cloth diapers? I currently have 1 baby left in cloth. Penny is baby #4 and 15 months old. We had 2 in cloth for a short time, as my son Luke, transitioned to the potty after Penny was born. Having one size diapers made life a little easier when 2 were in diapers! Anything else you'd like to share about Go, Baby, Go! Shop? Go, Baby, Go! Is an at-home business with an on-line shop & Independent Consultants now in 6 states, including Texas. We offer personal consultations, classes & cloth diaper parties. All our consultants love cloth diapers as much as we do, and I LOVE that I am helping other mothers earn a little money while educating and helping other parents with the switch to cloth. What are your favorite Knickernappies products and why? I LOVE the one-size pocket diapers! The side snaps are a favorite feature, not to mention the large size range! The colors are so bright & adorable! Stay connected with Go, Baby, Go! by following them on FaceBook and Twitter! *Special Offer: Save 10% off on in-stock Knickernappies Onesize Diapers & LoopyDo Inserts through July 15, 2010! This week's Featured Retailer is Diaper Junction! 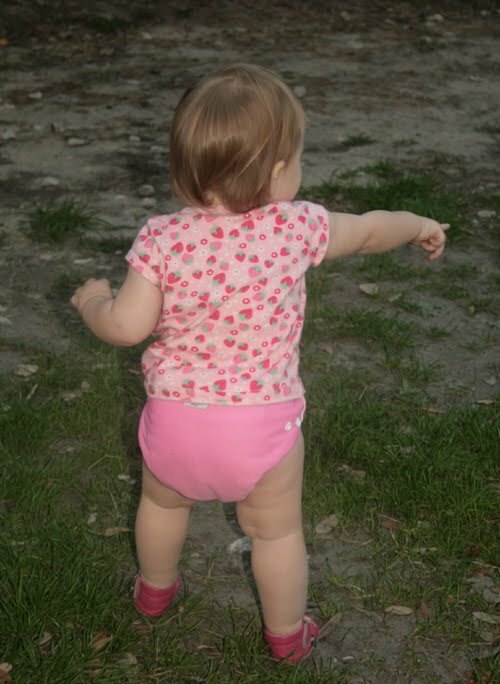 Knickernappies Sighting on The Cloth Diaper Blog! Where do all the cloth diapering mamas hang out? A Modern Mommys Cloth Diaper Cheat Sheet! How do you know if you need new inserts?